The Oyster Perpetual Yacht-Master II regatta chronograph spells uncompromising adventure. Inspired by the winds of change, this model sets new sights in the art of watchmaking. Intended for experienced skippers as well as yachting enthusiasts, this regatta chronograph is born of the longstanding relationship that Rolex enjoys with the sea, sailing and the mysteries of the deep. It perpetuates the supremacy of the Oyster, designed to resist water and conquer the elements. Featuring an unprecedented horological complication, the Yacht-Master II and its programmable countdown memory signal a new generation that draws on a wellspring of know-how and innovation.The Yacht-Master II is much more than the culmination of Rolex technology or that indispensable instrument at the starting line of a regatta. It is a moment of pure pleasure to be savoured both on land and at sea. The Oyster Perpetual Yacht-Master II regatta chronograph is the first watch to have a programmable countdown feature with a mechanical memory, which gives it the advantage of being able to be set according to the countdown time of each regatta. Intended for lovers of yachting as well as for experienced skippers, it is an indispensable tool at the starting line of regattas. 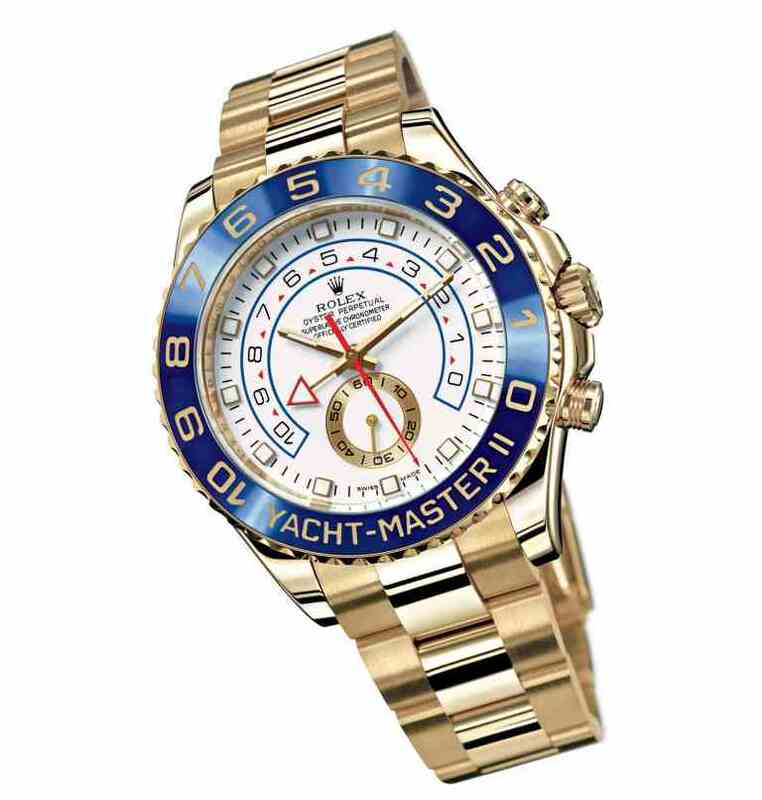 With the Yacht-Master II, it is possible to program a countdown of 0 to 10 minutes. During the starting sequences, it can be synchronised to the official countdown. This horological complication is heir to all of Rolex’s watchmaking know-how and benefits from the vertical integration carried out by the company over the last 10 years. A unique interaction between the movement, the case and the bezel makes the Yacht-Master II a completely new creation, a new generation watch. The various functions of this new Oyster professional are designed to be executed easily using only one hand. The Yacht-Master II is equipped with a new movement, the 4160 calibre, consisting of 360 components, entirely designed and manufactured by Rolex. The heart of the movement beats at 28,800 vibrations per hour. Its blue PARACHROM® hairspring with a Breguet overcoil is up to 10 times more resistant to shocks and insensitive to magnetic fields. This Rolex innovation endows the watch with excellent chronometric performance certified by COSC (Contrôle officiel suisse des Chronomètres – Swiss Official Chronometer Testing Institute). The countdown mechanism is constructed using a column wheel and a vertical clutch. The choice of this exclusive architecture is clearly characteristic of the Rolex new-generation chronograph movements. Rolex engineers and watchmakers achieved an impressive technical feat by developing a new mechanical programmable countdown function. A mechanical memory system makes it possible for the wearer to program, in advance and permanently (unless it is intentionally modified) the countdown time for the start of a regatta. The watch can be used in regattas with various starting sequences. Fully automatic, equipped with a Perpetual rotor, the Yacht-Master II movement has a power reserve of 72 hours. Crafted from a solid block of 18 ct yellow or white gold, the Yacht-Master II case has diameter of 42.6 mm. Equipped with a Triplock winding crown protected by shoulders, it has two pushers, one on either side of the winding crown. The start/stop pusher located at the two o’clock position starts and stops the countdown. The reset pusher located at the four o’clock position has three functions: programming, synchronising and setting the countdown. The innovation involves the interaction between the case and the movement, thanks to the Ring Command bezel, which is used for programming the duration of the countdown. The Yacht-Master II is guaranteed waterproof to 100 metres. The Yacht-Master II is equipped with a Ring Command bezel designed and developed by Rolex. Rotatable 90°, this innovation allows access to the programming function of the countdown, then to the locking of this programming. Although it is very complex from a watchmaking point of view, this interaction between the bezel and the movement makes the Yacht-Master II extremely easy to use. The Ring Command bezel is available in two versions : With a blue ceramic disc having numerals engraved in yellow gold for the 18 ct yellow gold version or in one-piece platinum with raised numerals for the 18 ct white gold version. The hour and minute hands are fixed in the centre of the Yacht-Master II, while the seconds hand is at the six o’clock position. The countdown counter located between eight o’clock and four o’clock positions and the countdown seconds hand (red hand in the centre) show the time remaining before the start of the regatta. Particular attention was paid to its legibility so that it can be easily read at a glance. The Yacht-Master II features an Oyster bracelet with an Oysterlock clasp and an Easylink comfort extension link. The functioning of the Yacht-Master II is very simple. With one hand, the user can rapidly programme the countdown. Likewise, he can start, stop, set or synchronise it, while it is in progress, to the official countdown with a simple press of a pusher. 1. TIMING THE START OF A REGATTA: Press the start/stop pusher to start the countdown. At the end of the countdown, the minute hand stops by itself at 0. The seconds hand continues to turn. hand returns to 0. When the reset pusher is released, the minute countdown hand and the seconds countdown hand are automatically activated. 3. STOPPING THE COUNTDOWN: Press the start/stop pusher. 4. SETTING THE COUNTDOWN: Make certain that the countdown is stopped. Press the reset pusher. The minute countdown hand returns to the minute programmed at the last setting and the seconds countdown hand returns to 0. The countdown is ready to be started. 5. PROGRAMMING THE COUNTDOWN: First, make certain that the countdown is stopped. Turn the bezel 90° counterclockwise. 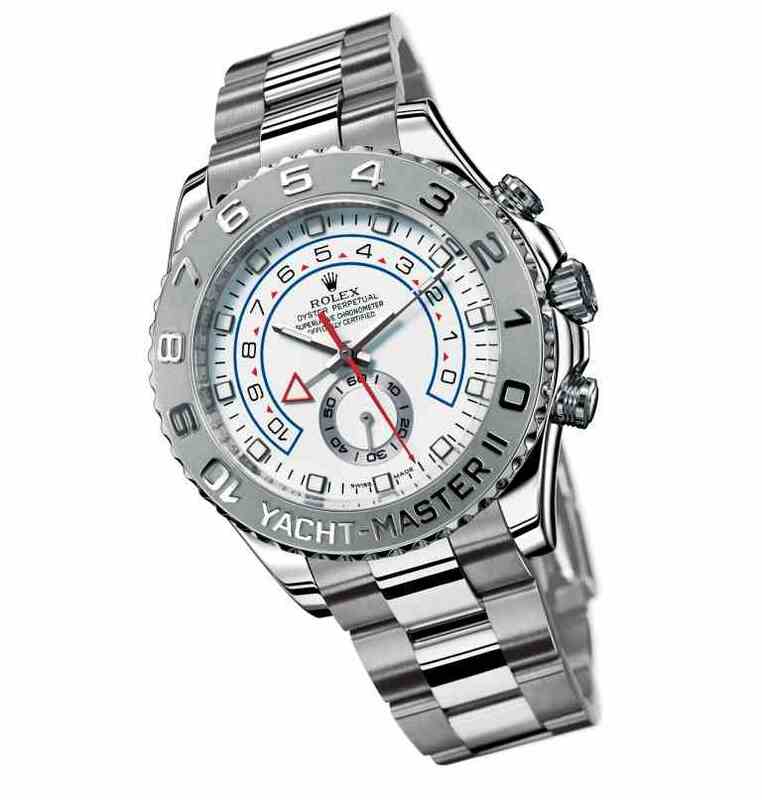 The inscription Yacht-Master II should be aligned with the winding crown. This locks the start/stop pusher. Press the reset pusher. You will hear a click. The pusher remains depressed. Unscrew the winding crown to position 1, without pulling on the stem. (The same as for manual winding) Position the hand at the desired minute by turning the winding crown in the winding direction. The minute countdown hand moves from 0 to 10 minutes by increments of one minute. At 10 minutes, if the user continues to turn the crown, the hand returns to 0. Return the bezel to its initial position by rotating it 90° clockwise. You will hear a click. This returns the reset pusher to its initial position and unlocks the start/stop pusher. Push down and screw down the winding crown. The countdown is ready to be activated according to the time programmed.